Members of the Baha’i communities in Arlington, Washington, DC, and across the country are watching developments in Iran with concern – Seven leaders of Iran’s Baha’i minority went on trial in Tehran Tuesday (January 12) accused of spying for Israel. The seven — two women and five men — are also accused of spreading propaganda against the Islamic republic and committing religious offenses, charges that can carry the death penalty. 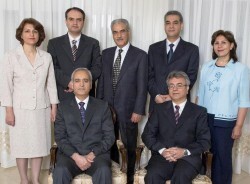 The seven leaders of the Baha’i Faith in Iran have been held in prison for more than 18 months.